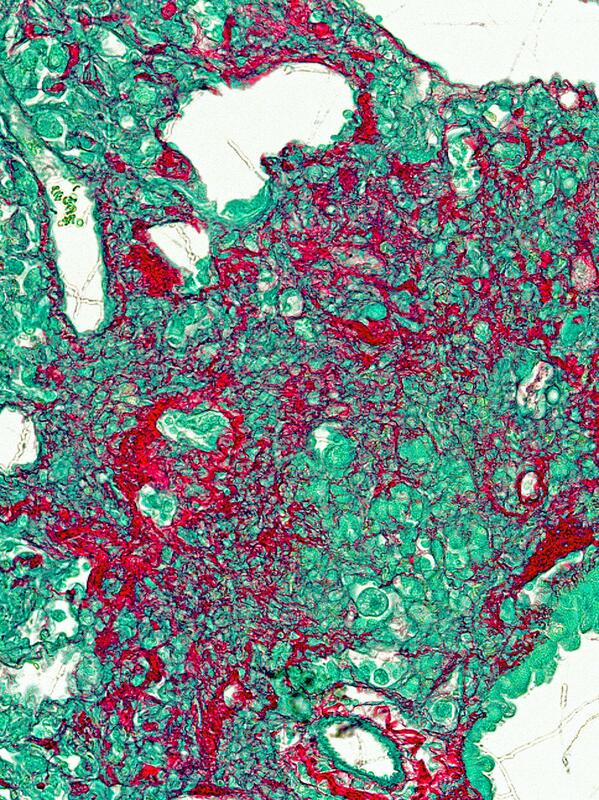 CINCINNATI — Scientists searching for a therapy to stop the deadly and mostly untreatable lung disease, idiopathic pulmonary fibrosis (IPF), found a new molecular target that slows or stops the illness in preclinical laboratory tests. A research team at Cincinnati Children's Hospital Medical Center reports its data in the journal Cell Reports. It found that a gene called FOXF1 inhibits the IPF disease process, which includes extensive scarring in lung connective tissues, hyper-production of harmful cells called myofibroblasts and excessive lung inflammation. "The exact cause of IPF is unknown and effective treatments are needed. This study identifies a novel anti-fibrotic drug target that inhibits pulmonary fibrosis in our preclinical models," said lead investigator Tanya Kalin, MD, PhD, Division of Pulmonary Biology. "We are developing different therapeutic approaches and conducting preclinical tests to increase FOXF1 expression in the cells of lung connective tissues." Although Kalin stressed that an estimated two to three years of additional laboratory study and development are needed before it's known if the data can be applied to clinical treatment, the research team is working on several potential therapeutic tools to boost FOXF1 levels in IPF. This includes testing a novel small-molecule compound that stabilizes FOXF1 and inhibits myofibroblasts in IPF. Researchers also are testing a nanoparticle-based gene delivery method to get FOXF1 into lungs with IPS. FOXF1 is a transcription factor–a regulator gene that essentially tells other genes what to do, including what proteins to make and biological processes to help initiate or inhibit. The current study shows FOXF1 is supposed to act as a molecular switch for two other genes called cadherins (CDH2 and CDH11). IPF's precise causes remain unknown, but genetic predisposition, smoking and other potential environmental factors are suspected. Also under investigation are the effects these factors may have on human epigenetics–how environment changes regulate the activity of our genes. To induce and study the IPF disease process in laboratory mice, the rodents were administered a chemotherapy agent for treating certain cancers called bleomycin. The chemical is toxic to the respiratory system and triggered tissue damage and fibrotic scarring in the animals' lungs. Human IPF biopsy samples were also used in these studies. The most common signs and symptoms of the disease are shortness of breath and a persistent dry, hacking cough. Funding support for the research came in part from the NIH (T32-HR007752, R01HL132849, R56HL126660, RO1HL84151, RO1HL123490).